BACKGROUND: There is much concern about the migration of health professionals from developing countries, and the contribution of active recruitment to the phenomenon. One active recruitment strategy is advertisements in professional journals and other media. OBJECTIVE: To establish the trends in foreign advertisements for doctors placed in the South African Medical Journal (SAMJ) from January 2006 to December 2010. METHODS: A retrospective review was conducted of 60 issues of the SAMJ published in the preview years. Printed journals were scanned for foreign advertisements. The findings were compared with a review of 2000 - 2004 in the same journal. RESULTS: There were 1 176 foreign advertisements placed in the SAMJ in the review period, reducing from 355 in 2006 to 121 in 2010. The countries placing the most advertisements were Australia (n=428, 36.4%), Canada (n=286, 24.3%), New Zealand (n=191, 16.2%) and the UK (n=108, 9.2%). Compared with the earlier findings, there was a reduction in advertisements for the top countries, excepting Australia. The top 4 countries remained the same for the 2 review periods, but the order changed, with Australia superseding the UK. CONCLUSION: The number of foreign advertisements placed in the SAMJ declined over the period under review, and there was a change in ranking of the top 4 advertising countries. These findings are discussed from the perspective of global human resources for health initiatives. Advertisements for foreign posts in 60 issues of the SAMJ from January 2006 to December 2010 were retrospectively reviewed. Data collected included the country of opportunity stated in the advertisement or position advertised, and the channel of communication/contact point. The recruiting agency was not recorded, partly because this was seldom stated on the advert. The advertising section of each journal was searched for 'Foreign Opportunities' content. Relevant details - country of opportunity/ source of advertisement, type of contact information given, the advertising agency where mentioned, and the total number of advertisements in an issue - were recorded, with a breakdown of the countries to which the advertisements pointed. Where an advertisement included opportunities in more than one country, this was recorded as one advertisement, but each of the countries mentioned was noted with the advertisement in the final analysis. There were 1 176 foreign advertisements for doctors/medical personnel in the SAMJ from January 2006 to December 2010: 355 in 2006 (average 29.6 per month), 283 (average 23.6 per month) in 2007, 242 (average 20.2 per month) in 2008, 175 (average 14.6 per month) in 2009 and 121 (average 10.08 per month) in 2010. The figures indicate a one-third decline in the number of advertisements published in the SAMJ for this period, from nearly 30 per month to just over 10 (Fig. 1). The advertisements tended to include only email contact, and rarely (international) telephone numbers. The originating countries were primarily Australia at 428 (36.4%), Canada 286 (24.3%), NZ 191 (16.2%), the UK 108 (9.2%), and Ireland 44 (3.7%). Nineteen (10.1%) others were the United Arab Emirates (UAE), Saudi Arabia and 2 African countries - Namibia and Botswana. 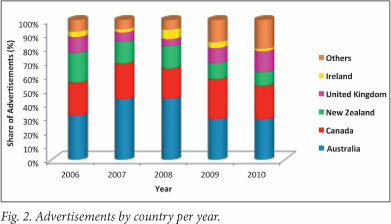 Table 1 shows the trends in annual numbers per main advertising country. There was a decline in numbers for all countries except the UK, which registered an apparent rise from 12 in 2008 to 19 in 2009 and 18 in 2010. For the African and Middle East countries, there was a fall in 2008 followed by a rise in 2009 and 2010 - attributable mainly to more advertisements for opportunities in those 2 years from Namibia (12), the UAE (8) and unspecified worldwide opportunities (10). Fig. 2 shows the relative contribution of the different countries in each year. Our main findings are that there was a steady decline in the total number of foreign advertisements for doctors from 355 in 2006 to 121 in 2010; and that the foremost 4 countries of opportunities for the 5 years were Australia, Canada, NZ and the UK. The 2000 - 2004 review by Rogerson30 recorded 2 522 advertisements, at an average total of 504 foreign advertisements per year with a ranked order of the UK, NZ, Australia and Canada. The total number of advertisements dropped for all the top 4 countries except for Australia, where the number rose from 409 (16.2%) in 2000 - 2004 to 428 (36.4%) in 2006 - 2010; but the number of advertisements for Australia also dropped considerably in 2009 and 2010. Canadian advertisements declined from 313 to 286 for the second review period, while the percentage contribution to the total number of advertisements doubled from 12.4% to 24.3%. 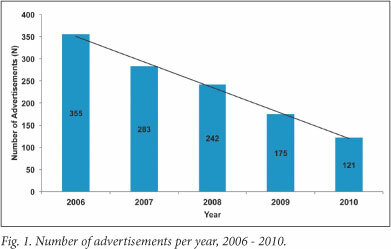 Advertisements from the UK registered the most notable decrease -from 895 (35.5%) in 2000 - 2004 to 108 (9.2%) in 2006 - 2010, and <2 advertisements per month in 2010. NZ also registered a sharp decline from 550 (21.8% of the total) in 2000 - 2004 to 191 (16.2%) in 2006 - 2010. Furthermore, SA signed a Memorandum of Understanding (MoU) with the British government, whereby the UK committed to impose a moratorium on recruitment of health professionals from SA.31 No similar MoUs were signed with the other top 3 countries, which would not explain the one-third decline in NZ advertisements. The considerable decline of UK advertisements may be more due to geopolitical changes in Europe than to the HRH crisis in developing countries. With expansion of the European Union (EU), health professionals from Eastern Europe could work in the EU, including the UK, which was obliged to employ them ahead of applicants from elsewhere, including SA. On the other hand, Australia, NZ and Canada were not affected by the opening up of the EU. Further support for the limited effect of the Commonwealth Code is the observation that, whereas the Code was adopted in 2003,30 the UK accounted for 42.1% of advertisements in 2004, which matched the combined advertising from Australia, Canada and NZ. Another possible consideration could be differing health systems in the top 4 countries. The UK National Health System (NHS) is publicly funded and centralised, notwithstanding trusts functioning as implementing agencies, and the ease for policies to be implemented across the country. The NZ healthcare system is closer to that of the NHS, with the ministry of health exercising ultimate control over district health boards. In Canada, health service delivery is managed by the provinces, while in Australia the states are responsible for healthcare. The application of international policy, such as the voluntary Commonwealth Code, may not be a local government priority that may take decisions to recruit health workers. However, it is possible that apparent similarities between the health systems in NZ and the UK on the one hand, and Canada and Australia on the other, are incidental to the declines in advertising. A limitation of our study was that the reasons for the trends were not apparent from the data examined, nor could we ascertain the effect of the reduction in number of advertisements on the number of doctors recruited from SA over that time. Anecdotal reports suggest that the number of doctors emigrating has slowed down recently and that some migrants have started returning (Percy Mahlati, personal communication). These explanations remain speculative, although likely in the context of global HRH developments. This study also points to the utility of bilateral arrangements, which may be partly responsible for the reduction in active recruitment of health professionals from SA by UK agencies. These trends should also be understood from the perspective that the review period was characterised by intensive lobbying by African countries and civil society to curb migration or provide compensation, for instance via the World Health Assembly (WHA) and high-level meetings that focussed on the HRH crisis. Attention will soon focus on implementation of WHA Resolution 63.16 Code of Practice on the International Recruitment of Health personnel.26 While providing an ethical and human rights framework that guides destination and source countries to mitigate HRH migration via international agreements and national policies, it is also voluntary. It is unlikely that any of the observed trends could be attributed to the Code, as it had been in existence for less than a year at the time of this study. Acknowledgements. We are grateful to the staff at the library of the University of Limpopo's Turfloop Campus, and colleagues within the EQUINET HRH network, who wish to remain anonymous, for data review and comments.